The Copystar CS 6002i is a best-in-class Black and White MFP that combines print, copy, and color scan functionality into one powerful platform. To ensure that your organization runs at peak efficiency, the Copystar CS 6002i offers an unmatched array of standard features, professional finishing options, and host of customizable business applications that further streamline workflow. 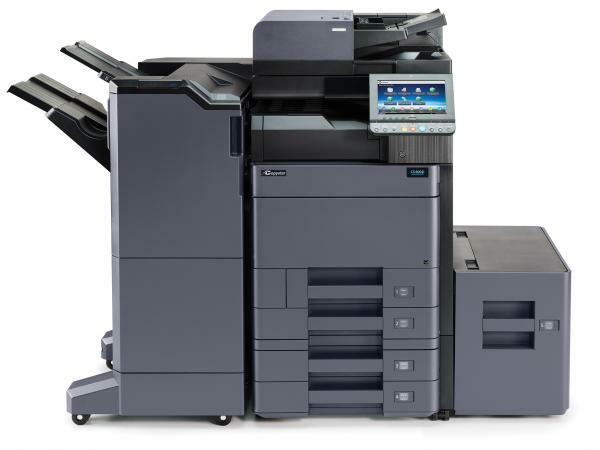 Add to that the award-winning ultra-reliability and unique long-life technology, and proven leadership in technology innovation, and the Copystar CS 6002i will transform end-to-end document processes… and drive bottom-line business growth. Your workday is demanding enough without the added struggle of inadequate technology. Kyocera’s state-of-the-art Copystar systems don’t just meet the challenges of your workplace – they elevate your capacity to overcome them. In an office armed with the CS 6002i versatility, efficiency, and unmatched productivity are part of the business routine. The printer, scanner, copy, and fax machine is built for reliability. Streamline your workflow with the intuitive touch screen control panel, extensive document management tools, and diverse array of optional features created to accelerate top-quality performance. And with its resource and energy conservation measures, the Copystar 6002i delivers impeccable results through technology you can trust. Professional quality printing is expedited to speeds up to 60 pages per minute.